We are El Paso's ​residential glass specialists, with decades of experience in repair and replacement of all varieties of glass and mirror for the home. Whether you are hoping to increase the value of your home or simply need a repair, Baker Glass has you covered with the best solutions for cost-effective and quality craftsmanship. 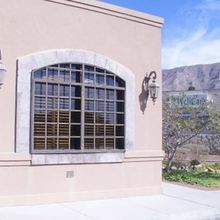 Home owners and builders all across El Paso have trusted Baker Glass for decades for their residential glass needs, whether for custom installation, repair, or to improve the beauty, function, or safety of home glass features such as windows, showers, doors, cabinets, tabletops, shelves, home décor and mirrors. We furnish and install shower doors and other glass panes that are outdated or need to be replaced for any reason and can also provide safety glass to meet all safety codes.